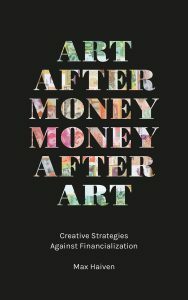 On October 10, 2018, the Center for the Study of Social Difference working group Unpayable Debt held an event to launch scholar Max Haiven’s book, Art After Money, Money After Art, and the second edition of Caribbean Debt Syllabus, the only digital resource available to study the significant impact of debt in Caribbean’s past and present. I found many elements of Max Haiven’s discussion about the increasingly blurred line between artists and activists fascinating. I heard him make parallels to surrealism, expressing that our potential is beyond the scope of our imaginations and that we can use various conceptual tools to reflect on this sublime potential. Financialization, hedge funds and big investment banks dominating a capitalistic economy hinder us from discovering the full breadth of our imagination, and Haiven calls upon artists/activists to combat this. Haiven explains money as a force that has so much power over our lives–but it can be a medium of oppression and exploitation or a medium of creativity. It can be used as a medium to disrupt capitalism, telling stories and carrying certain values that transcend an exploitative, oppressive system, he contends. I am left wondering, however, how much this conception of currency really translates into the Caribbean landscape. I used to live in Jamaica, where my dad is from, and my mom is from Guyana–thinking about these two countries I grew up between, I really don’t know how much people would care about the appearance of currency as a form of protest against capitalism. I’m thinking of someone in a long line to get two beef patties in Kingston, perhaps the most accessible and cheapest meal there–would they pay attention to the aesthetic of the currency? This would be a great experiment, though. In terms of the additions to the Caribbean Debt Syllabus, I was especially moved by the presenters on indenture and law. The topic of indenture is particularly interesting to me since my mother’s ancestors were East Indian indentured laborers in Guyana. I grew up hearing my family members refer to themselves as “coolie.” Although the presenter’s area of focus was mainly in Suriname, her depiction of different ethnic groups in that society as separate yet respected in theory resonated with me. Yes, everyone is separate–my family’s home there in Berbice is literally flanked by East Indian homes on one side of the street, across from only black homes on the other. The indentured society is certainly separate–but how can each group even have the opportunity to respect the other with such little interaction between them? Respecting another group cannot take the form of complete isolation from them. I plan on writing my final paper for Jose Moya’s class, World Migration, on indentured labor in Guyana, so I actually wrote down some of the presenter’s sources that will definitely be useful for that.